Oh my - how lovely and I love your music too! Your garden still looks wonderful and thank you so much for participating! 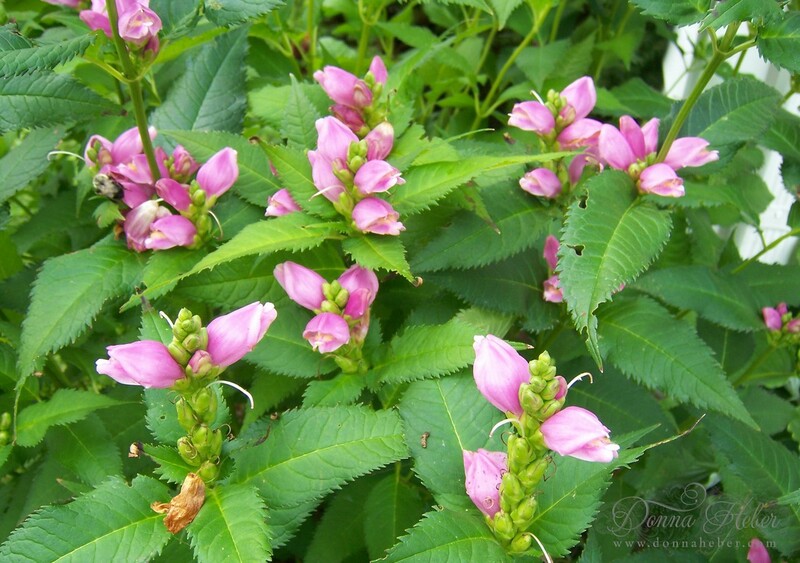 I've always liked chelone and have the white and two different pinks, they're great low maintenance perennials. 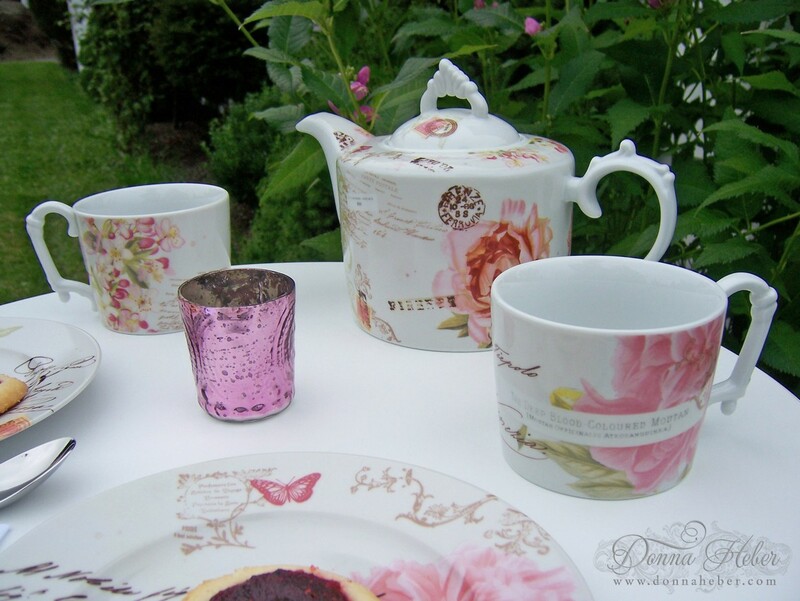 Yours are a perfect backdrop and compliment to the pinks on your tea table. I would love to have the other mug along with a cookie with you! so beautiful donna, great decoration. 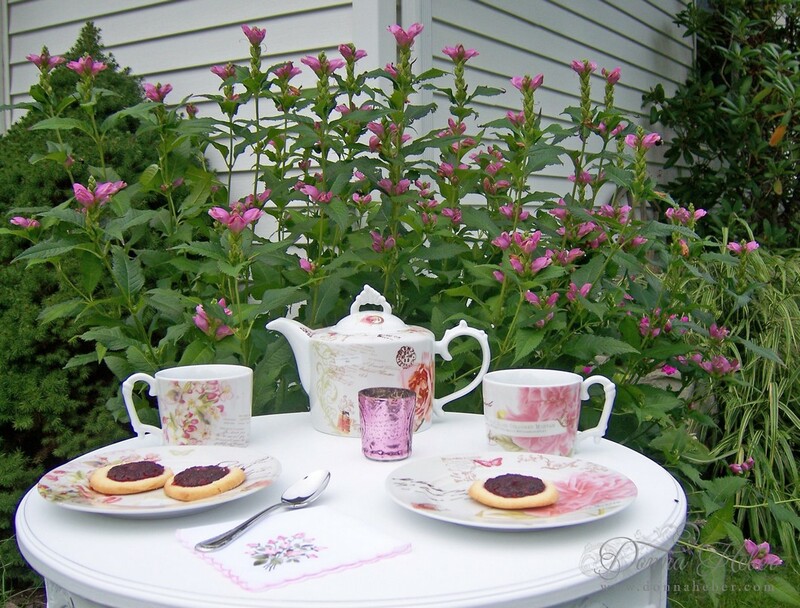 What a darling tea table set out in front of those pretty posies. 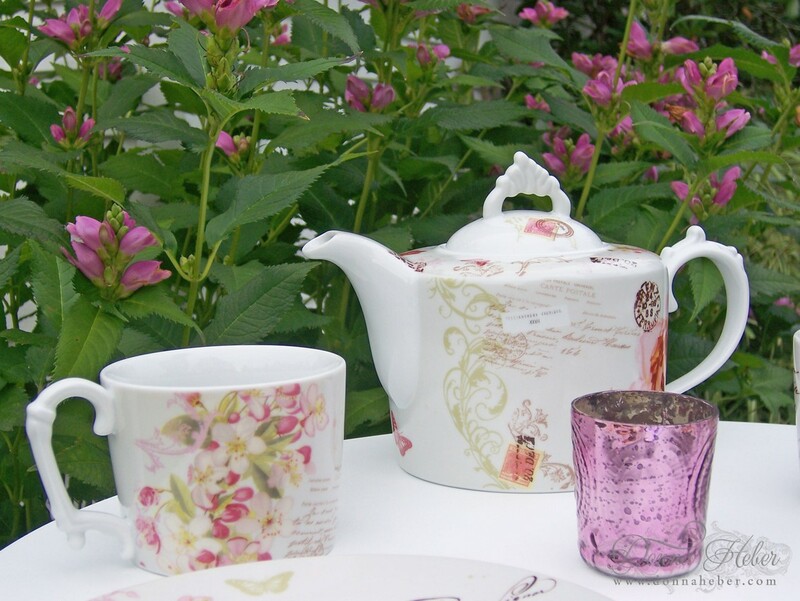 I love the china with the flowers and script on them. Your cookies look yummy and would taste nice with a cup of tea in one of those pretty mugs. I see you are also participating in my Tea Time party next week. Thank you and be sure to stop by then too and link up. Wishing you a lovely day. Just lovely Donna. I planted a turtlehead last year and it came back twice the size this summer. I love it. Those raspberry cookies look delicious! Have a terrific weekend. your tea mugs and tea pot look so adorable. I love when modern dishes have a bit romantique and also nice rose decoration. Really a pretty and inviting table. Just beautiful Donna! Love Rosanna dishes- I have a few myself. I love the pattern on the tea pot and the plates. Your napkins are lovely- would be a shame to ever stain them! 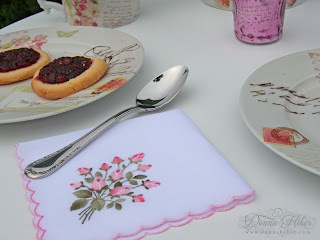 Love the china and the beautiful napkins! I don't think I've ever seen those turlehead flowers before...very different and pretty. Your tea setting is lovely. The teapot and mugs are beautiful! It's such a joy to look at the pictures you share, like your gardening, too. 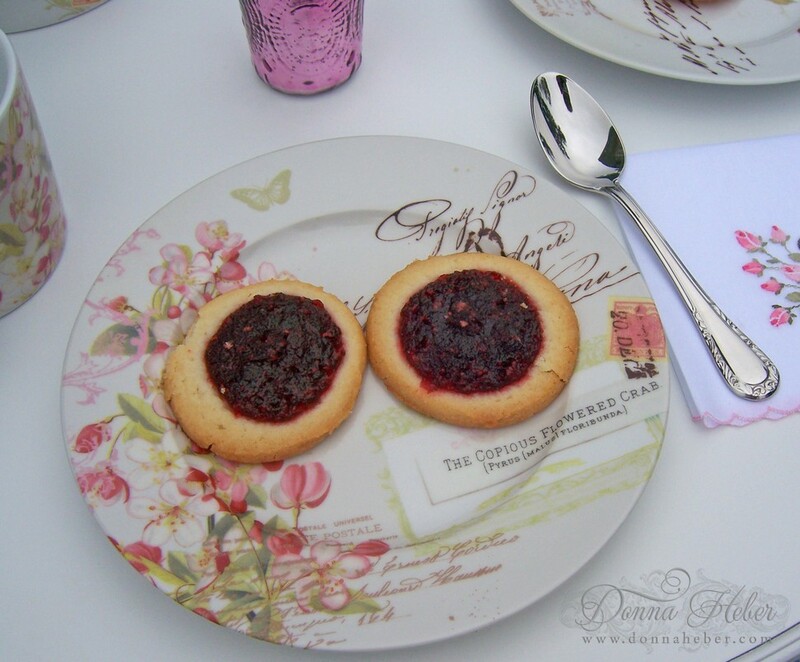 I've just enjoyed a wonderful cup of tea and a raspberry drop cookie ... delicious! Thanks for starting my morning off perfectly! Oh,goodness, Donna! You have me lusting (!!!!!!!) after your beautiful Primavera. I love the mix of antique Italian love letters and postcards with 19th century botanical prints in rosy pinks. Really special. The mugs are a great match. Happy Tea Day! Donna, this is so, so lovely! The colors of your tea service make my heart beat faster. Just dreamy! What a delightful seasonal post! I just love your overall Primavera look and feel for this week's teatime! ~ Beyond exceptionally lovely in every exquisite detail! And my oh my!.., What an usually lovely tea service and so artistically arranged! Happy Tuesday Tea's and have a marvelous week! Oh Donna! This botanical set is gorgeous! What a pretty setting it makes too. You did a fab job on the tablescaping. 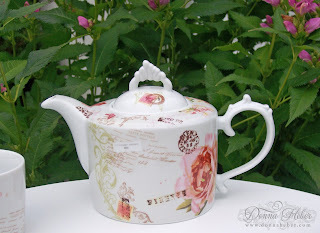 Love the design on the teapot. Just beautiful. 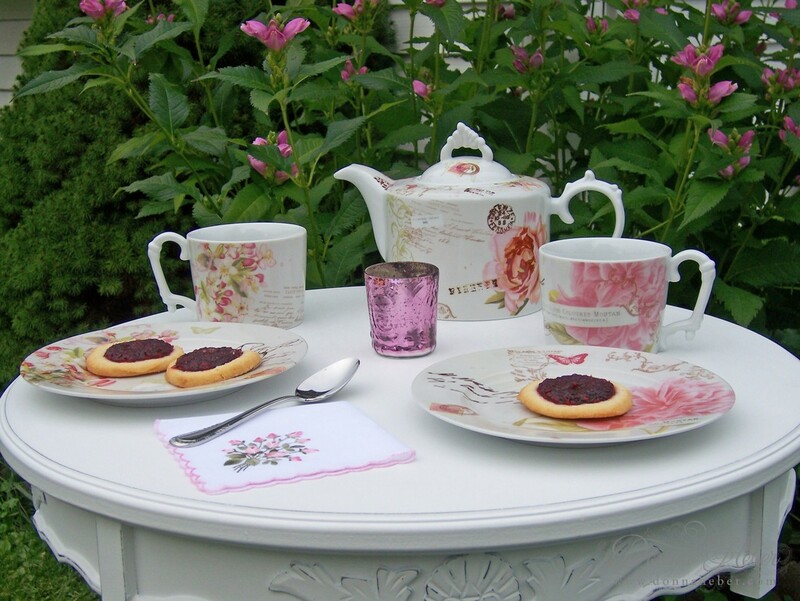 Gorgeous, I love the Rosanna china and your tea set it's beautiful! I'm loving the teapot. Great tablescape outdoors, sorrounded by flowers! I just dropped from Tuesday Tea for Two.